Includes an extract from a text by Stephanie Moran about Obscure Secure. Art historian, critic and biographer Frances Spalding discusses her work and reflections with psychoanalyst and poet Valerie Sinason. Panel discussion facilitated by artist and art therapist Emma Cameron with artists: Molly Thomson, Jane Frederick, Claudia Böse, Hayley Field and Jacqueline Utley. 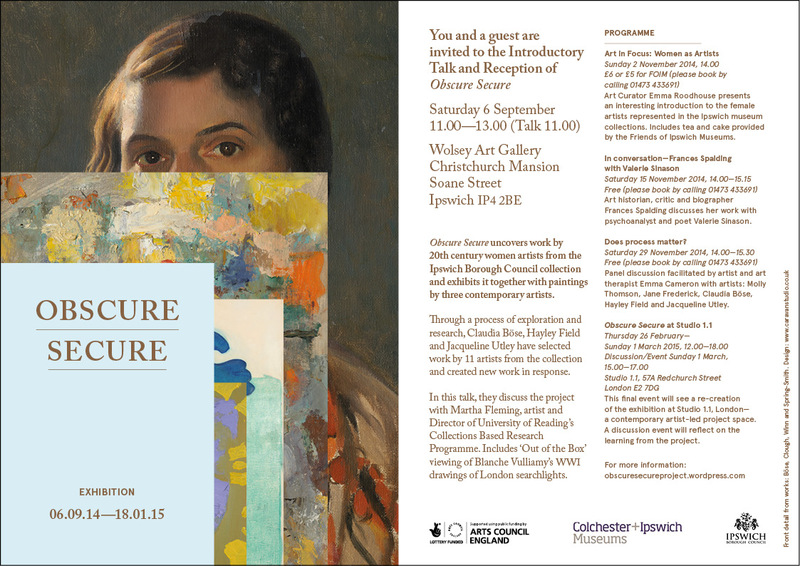 A2 Poster and leaflet, includes a discussion between Hayley Field, Claudia Bose and Jacqueline Utley about process.